Homemade fun and simple pleasures abound! 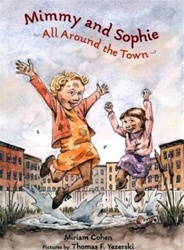 }}Mimmy and Sophie are sisters who live in Brooklyn, New York, during the Great Depression. Even though their parents don't have a lot of money, Mimmy and Sophie still have lots of fun together, whether they're finding treasure, going to Coney Island, or playing in mud puddles. }}Charming black-and-white drawings by Thomas F. Yezerski accompany these sweet stories, perfect for independent reading or for reading aloud, about two sisters who aren't always best friends but are always there for each other. My First Parsha Reader Come, Let Us Be Joyful! All-Star Season How Did The Animals Help God?